Ronita from Familyzone Learning was recently asked by the Vereniging vir Voorskoolse Opvoeding en Sorg (VVOS) to write a quick note on Dyslexia in children explaining the basics. The Afrikaans version was published on the VVOS website you can read the English version below. 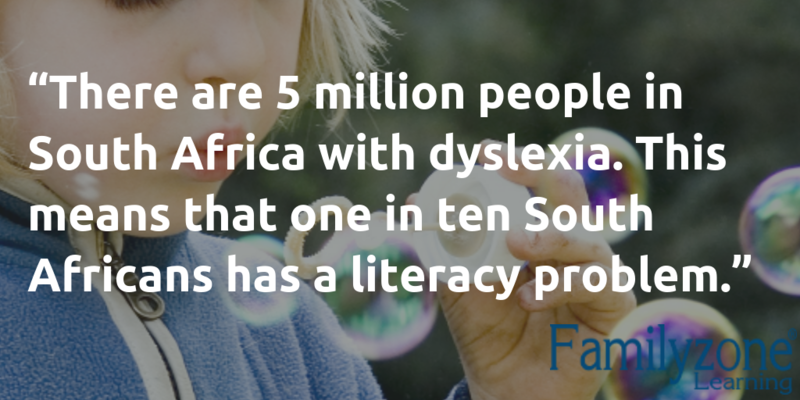 According to The Dyslexia Awareness conference hosted by the Mail & Guardian in September 2013, there are 5 million people in South Africa with dyslexia. This means that one in ten South Africans has a literacy problem. What is dyslexia? How does it affect children? Dyslexia can be more than just a reading problem. It can also affect mathematics and attention skills. A child with dyslexia appears verbally bright, but struggles to read or write (often mistaking a b for a d or vice versa). They are often labelled as lazy or unintelligent in the class setting due to a tendency to daydream. They struggle to comprehend the concept of time and are often late or unable to read the time on a clock. They often struggle identifying left from right. Are there only negative associations with dyslexia? No not all! Most dyslexics are very creative, arty and extremely good at thinking out of the box (a very handy skill to have as an entrepreneur). They are often good at sport and are musically talented. Dyslexics needs help to cope at school, especially once they start learning the alphabet. They are extremely visual thinkers and struggle to adapt to a verbal orientated class. The Davis Dyslexia Correction® Program offers a child the support he/she needs in order to excel in a verbal environment. It does not address the symptoms but rather the root cause of the disorder in a creative and fun way. The child’s natural creative talents are used to help him/her master the alphabet, punctuation and improve reading ability and comprehension without using repetitive techniques that would be tedious for their creative minds. The program does not rely on phonics or any special medications. The young learner program helps children from the age of 5 to improve reading fluency in order to ensure that they don’t develop a learning disorder once they start to attend formal schooling. It ensures that their word recognition is of the highest for their age group. These programs can only be facilitated by a trained Davis Correction Facilitator.